Food is something that I have been in love with since I was a child. But you might not think so, had you seen me as a child. I was stick thin and could be easily mistaken for one of those kids that Angelina Jolie could adopt. Some weird hormone in me coupled with a very high metabolic rate kept me a size minus one for decades. But the love of food stayed. As a kid I loved watching cookery shows and home shop channels. Why home shop you ask? Those channels used to show kitchen appliances that fascinated me. Like those super choppers, cutters and juicers. I remember writing down the code of the product and jotting down the telephone number to buy the product. And then the routine followed where I would pester my mother to buy the product and she would always say no. Khana Khazana was the first ever cookery show that I saw. Sanjeev Kapoor was and will always remain a cooking wizard in my life. Yes, irrespective of his unnecessary stint in the dance show Jhalak Dikhla Jaa. Next came the Goddess of cooking, Tarla Dalal. My mother had an age old recipe book of hers and I would spend a lot of time reading those recipes and going gaga over the pictures. By the time I was around seven, the fascination of cooking was at its peak. And my mother was a wonderful teacher. She patiently stood by my side as I tried crazy recipes and giving them equally crazy names. The first thing that I ever cooked was a mango jam, with ample assistance from my mother. It was mango season and we had cartons of mangoes at home. So we came up with the idea of the jam and it turned out to be brilliant! Today as I look back at those days I cannot help but smile. The fascination for food is still there and I enjoy cooking like never before. My mother has been my role model when it comes to cooking for me. She used to bake cookies and cakes without an oven. She used to try diverse recipes and it always tasted so good. Inspite of having a full time job, she used to cook fresh food for us for every meal. Be it breakfast, lunch, the evening snack or dinner. It was always made fresh and served piping hot. No leftovers from the fridge ever. Pancakes and waffles are famous now, but my mom used to make it for us twenty years ago as an evening snack. Every recipe was stored in her mind and it always tasted the same. Delicious. Her pork curry is my favorite and I still devour it like a child whenever I visit her. After marriage, the transition was difficult. I was married to a Brahmin household where meat was a taboo. They did not use garlic either. But my ever sweet and loving husband took me out every alternate day to eat whatever I wanted to. He is a supreme foodie too and together we went out and explored almost every eatery in town. Soon, our understanding of food improved and we were able to bond more over food. Together we began reviewing restaurants, he the veg food and I the non veg food. This was an activity we loved and looked forward too. Every day after work we would go out and try some street food. At times we would visit fine dining restaurants and at times the high class ones. But frankly, nothing can match the taste of the street food or the food cooked by my mom. Some high priced restaurants are seriously overrated and do not deliver as promised. Having said that, there are also some of them who offer heaven on a platter. Once we moved to a place of our own, my husband and I started experimenting with cooking together. He loves to bake and makes the world's best peanut butter cookies! Since both of us have a penchant of making things from scratch, we make break, pizzas, ice creams and pasta sauces by ourselves. I love cooking as much as I love eating. And I can never cook just for the sake of it. I'm just like my mom in this regard. No left overs for me and no storing cooked food in the fridge. I strongly believe that food loses all its nutrition once it is cooked and placed in the fridge. As much as I know modern cooking, I also cherish the traditional recipes. I make pasta as well as sambhar. I bake cookies and can yet make perfectly round rotis. I can whip up delicate panna cottas as well as I can make a payasam. I can do anything for food and I love to cook for the ones I love. 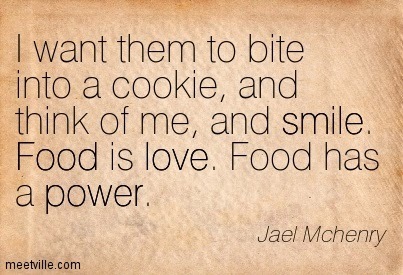 Food for me is love made edible and is a pure form of love. As long as food is made with love, interest and passion it will never feel like a chore. Look at me, I make breakfast and lunch before I head to work. After ten hours of work, I still come back and prepare dinner for us. I love to see the happiness on my husbands face as he takes the first bite. Food speaks a language of its own and only those who appreciate food would be able to hear it. I love food and anything that has to do with it. Be it eating, reviewing, watching or cooking, as long as it revolves around food I'm a happy Lioness. I love to eat too! So good you have a foodie for a husband and one who cooks!! Lovely quote. Hahahah, they used to call me size -1 too!!! They used to say, tujhe dekhke Kareena Kapoor sharma jayegi :P (this was during her size 0 days). But I was also the one who used to eat more than the average person :D :D :D Like Jughead!!! 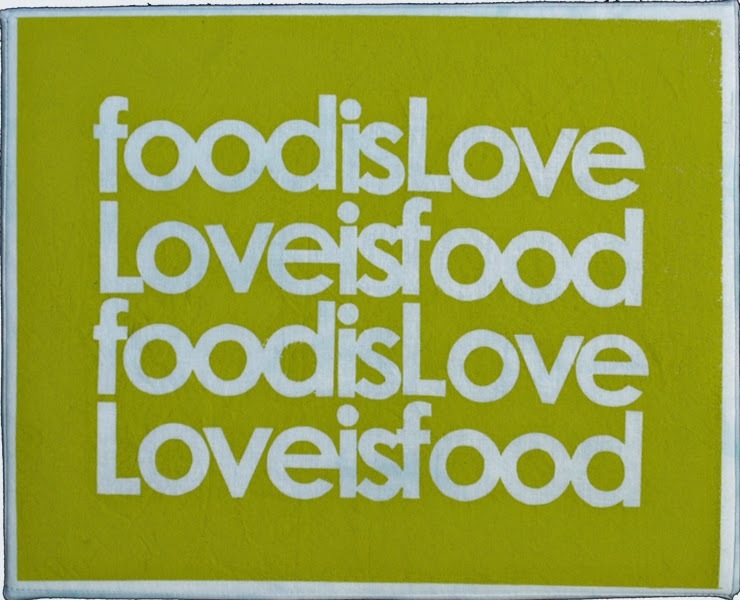 Totally agree with you - food is love served on a plate! How much more do we have in common, girl? Another thing that we share! Love for cooking and baking :) Like you, some of my favorite dishes are home made ones by my Mom. Nothing can replace that love. Like, ever! Do you not get leftovers or do you throw them away? I often cook something which will do us for one or two more meals even if I freeze them for later. Jo, I cook exactly for two. There is hardly anything left over. Usually they are old slices of bread, or some sauces. I throw those away. I have made peace with not liking cooking. Although, I do take the effort to make sure I cook fresh and healthy for my husband. Anything other than home food doesn't agree with him and my love for him is enough to cook what agrees with him the best. I love to eat though and as everyone else, believe mom's food is the best food on earth. My boyfriend & I both love to cook - but my kitchen is too small for more than one of us to work at a time, so the time is never shared. Gives me time to read on the sofa though!